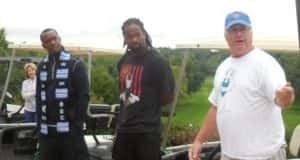 The Greene County Chamber and Tourism held its annual golf outing Friday but in a different way this year. Chamber Interim Director Michael Reese said the Chamber is not only helping to raise money for Avril Shahan’s charity to purchase specially made shirts for port-access to deliver chemotherapy treatments to children with cancer, but they’ve included celebrities as participants. Kahlil Carter was one of them. 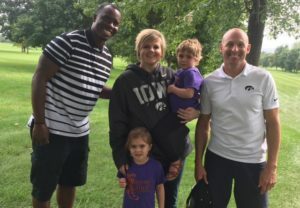 He is a former quarterback and wide receiver for the University of Arkansas football team, as well as a former player in the NFL, Arena Football League, NFL Europe, and Canadian Football League. He said he wanted to support Avril’s cause because of what his past coaches have always told him. Former Iowa State University wide receiver Darius Reynolds also participated. He was back in Iowa visiting his son and currently plays for the Philadelphia Soul in the Arena Football League. He talked about being able to support Avril’s cause, while also managing his family and professional athletic career. Reese added that an online auction will be available soon, with several items for people to bid on. All proceeds will go back to the Shahan family for the chemotherapy shirts.